Marugami Waterfall (丸神の滝）is one of the 100 best waterwaterfalls in Japan and only one in Saitama Prefecture. It has about 76m (230 feet) height. Because the waterfall is not so popular, nature around the waterfall is still preserved. 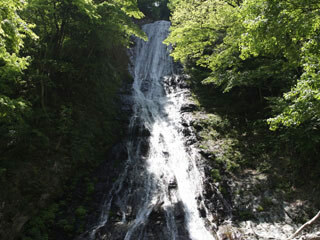 Not like standard water waterfall, Marugami Waterfall does not have much amount of water falling. So, the waterfall is very quiet and beautiful. There are camping area at the entrance, restroom and parking. Marugami waterfall (丸神の滝, marugaminotaki) is one of the quiet and beautiful waterwaterfalls in Japan. You have Nice short walking to the waterfall. You could spend nice time watching the waterfall. Because the waterfall gives cool mist and there are many trees around the waterfall, you could bring your book and spend nice time reading here. There is a bench for that.